Troy grew up in Montevideo, Minnesota and graduated from Montevideo High School. He graduated from Southwest Minnesota State University (SMSU) in Marshall with a Bachelor’s Degree in Health Education. Troy earned his Bachelor of Science Degree in Mortuary Science in 1999, and he worked as a Licensed Funeral Director in the Twin Cities, Benson, and Montevideo before relocating to Perham in 2017, where Tonya is working as a Nurse Midwife and Nurse Practitioner at Sanford Health. Troy and Tanya have five children: Kelsie, Tia, Troy, Finn, and Cate; and they enjoy spending their free time attending their children's sporting events, both in high school and college. Their family is very excited to be in the Lakes Area. Shawn grew up in Edmore, North Dakota. He attended the University of North Dakota in Grand Forks, later transferring to the University of Minnesota, Minneapolis to complete his degree in Mortuary Science. While attending school in Minneapolis, Shawn worked at Huber Funeral Homes in Excelsior, Eden Prairie and Mound, Evans-Nordby Funeral Home in Brooklyn Center and Osseo and Gearty-Delmore Funeral Homes in Plymouth and Robbinsdale. Following his graduation Shawn managed Stanley-Iverson Funeral Home in McVille, North Dakota from 2002 until joining David-Donehower Funeral Home in Detroit Lakes in 2006. Shawn currently serves on the Detroit Lakes City Planning Commission and is a board member at the Detroit Lakes DAC (Developmental Achievement Center). He and his wife Sarah are members at First Lutheran Church in Detroit Lakes. He is also a member of the Detroit Lakes Jaycees and Kiwanis Club. In his personal time, he enjoys spending time with his family, attending Laker sporting events along with hunting and fishing. Shawn and Sarah live in Detroit Lakes and have two children: Jax and Lakyn. Lynn was born and raised in Andover, Minnesota. She went on to attend Minnesota State Community and Technical College in Detroit Lakes, graduating with a Licensed Practical Nursing (LPN) Degree. She went on to further her education, receiving an Associate's Degree in Mortuary Science from Kansas City Community College. In addition to working at the Funeral Home, Lynn also works as an LPN at Essentia Health in Detroit Lakes. Lynn and her husband Steven have two daughters and they are members of the Holy Rosary Catholic Church in Detroit Lakes. Lynn is also a member of the Blaine VFW. In her personal time, Lynn enjoys spending time with family and friends, scrapbooking, and reading. Joleen grew up in Frazee and graduated in 1992. She earned a Professional Photography Degree from Ridgewater College in Willmar, MN. Joleen began working at Photo Magic in Perham after graduating. She started Joleen Giefer Photography in 1995, specializing in wedding photography for 16 years. She now enjoys capturing sports photography for the Frazee Forum, but her main focus is photo design work and creating personalized products. Joleen finds her role very rewarding with helping the families create the perfect farewell event for their loved one. She is a strong advocate for pre-planning funeral details from picking out your favorite photo to creating your own slideshow or life-history video. After graduating from college, Joleen was lucky enough to cross paths with Jeff Giefer after his return from the Marines and they were married in 1997. Blessed with 2 children, Jocelyn and Joby-John, the couple is on the verge of becoming empty-nesters and contemplate retiring in Costa Rica. Joleen enjoys dinners with friends, taking road trips in the 1980 motorhome, traveling and researching great places to travel to and giving life-lesson advice to her children. Denise Fredrickson was raised in rural Frazee and graduated from Frazee High School. After living in the Minneapolis area for three years, she moved back to the Frazee area and began a career in banking that extended over thirty-five years. Denise was VP of Mortgage Lending at a bank in Detroit Lakes prior to serving with Young Life Castaway Club on Pelican Lake for the last couple of years. She then took an early retirement. Denise has been active in organizations in both the Detroit Lakes and Frazee communities. Currently, she is involved with TeacHaiti, a non-profit organization providing education for children in Haiti; volunteers with the local Young Life organization; and serves at Lakes Area Vineyard Church. Denise’s heart is at home enjoying time with family. She and her husband, Jim, have five children and twenty-one grandchildren. Denise loves working with people and looks forward to the opportunity to serve others as the Preneed Specialist at David Donehower Funeral Home. Valerie was born in Sacramento California to a military family. They lived in several states during her childhood with their home town being Mahnomen, MN. Valerie graduated from Mahnomen High School and attended college at Minnesota State University of Moorhead, earning a Bachelor of Social Work Degree. She also completed a Child Development Accreditation program. Her professional career experiences include: Residential Counselor for juvenile boys at McCrossan Boys Ranch in Sioux Falls, S.D. ; Toddler Teacher at Children of the Lakes Child Care Center in Detroit Lakes; operated her own family child care business, Summer Haven Child Care; Becker and Clay County Area Coordinator for Provider’s Choice, Inc.; and Medical Social Worker at Essentia Health St. Mary’s Hospital in Detroit Lakes. Valerie enjoys life with her husband, Loran, and three children, Lee & daughter-in-law, Tricia, Mitchell and Andrea. They make their home on Little Cormorant Lake. Her hobbies include scrapbooking, crafting, reading, playing games, and travel. Valerie is a member of Lakes Area Vineyard Church and the Lake Park Women’s Auxiliary VFW. She has served on the Becker County Vulnerable Adult Protection Team, KARE Council, Detroit Lakes Family Child Care Association, LPA ECFE board, and the Ethics Committee at Essentia Health St. Mary’s. Valerie continues to welcome opportunities to volunteer service at church, school, and community activities. Valerie has a heart for caring as she provides ongoing emotional support to grieving individuals and families. Life after the death of a loved one can be challenging and painful. She is able to assist in the coordination of necessary paperwork, phone calls, and is familiar with other community resources. Her work with the STAR program (A Special Time to Always Remember) continues to make a positive difference in helping children better understand death, grieving, and the funeral process. The STAR class is available to families, civic groups and our community as requested. Gary graduated from Frazee High School in 1963. He attended Moorhead State College, served 4 years in the United States Navy and was awarded the Purple Heart. He graduated from Detroit Lakes Technical College in 1971. Gary retired as a Parts Consultant from Nereson’s in Detroit Lakes, MN. He and his wife, Marian, live near Vergas, MN and are active members of St. Paul’s Loon Lake Lutheran Church. 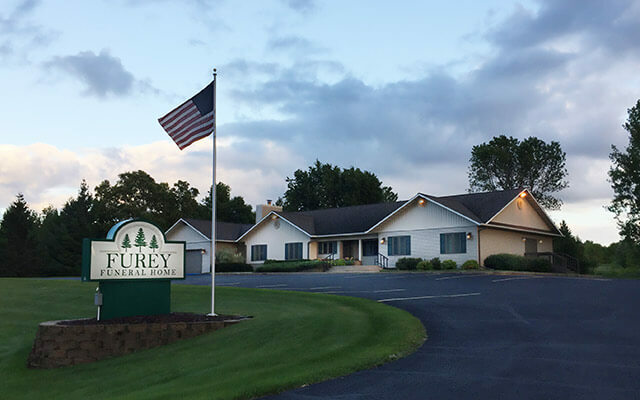 In 2010, Gary began working at Furey Funeral Home. In his spare time he enjoys hunting, fishing and singing with his quartet group “Not-i-fied” and the Heart O’ Lakes Harmony Barbershop Chorus. Marv was raised on a small diversified farm near Frazee, graduated from Frazee-Vergas High School and continued his education at the University of Minnesota from which received his Bachelor of Science degree in Agriculture in 1967. His vocational journey began in agricultural finance and culminated in a 26 year position with Vergas State Bank as loan officer. He retired from bank employment in 2010 and began as an assistant with Furey Funeral Home shortly thereafter. Judy and Marv met while students at the University and were married in 1968. They are parents of two adult children, Beth Brown, a resident of Brooklyn Park, MN, and Eric Enslin. Eric and his wife Katie live in Medfield, MA, with their children, Anna and Nicholas. Marv enjoys singing and is a 39 year member of the Barbershop Harmony Society. Local membership is with the Heart O’ Lakes Harmony chorus. Leisurely and casually, he enjoys short rides through the countryside on his Harley-Davidson motorcycle. Philanthropically, Marv serves his church, the Congregational Church of Detroit Lakes, United Church of Christ, as Stewardship Board Chair and member of the Administrative Council and choir. His involvement in Perham Lodge of Masons and to Olive Branch Chapter of the Order of Eastern Star are important commitments to him. He is Past Grand Patron of the Grand Chapter of Minnesota, Order of the Eastern Star. Lois is a longtime member of the Vergas community, where her husband, E.R. Wippich served as the Pastor of St. John’s Lutheran and St. Paul’s Lutheran churches. E.R. passed away in 2010. Lois remains active in her church community. She enjoys teaching preschool at Jesus Little Lamb Preschool in Vergas. Lois has 4 daughters, a son, a daughter-in-law and 3 sons-in-law, along with 14 grandchildren, who are truly a joy in her life. Lois began as the visitation attendant at Furey Funeral Home shortly after her husband’s passing in 2010. She is honored to care for each family served at the funeral home. Brikker Ware lives in Frazee, a 1994 graduate of Frazee High School. He attended Fergus Fergus Falls Community College transferring to Moorhead State University where he received a degree in business. He worked at Gary’s Furniture and Carpeting in Frazee after college. He now works for AFLAC Insurance. He has been on the Frazee Fire Department since 2001. He married to Kendal Ware in May of 2006. They have 1 son, Braxtyn and 1 daughter, Kella. Brikker and his wife are members of Harvest Fellowship Church in Frazee. In his personal time he enjoys going on walks, spending time with friends and family, hunting, and baking.